Wonder Girl Knits: loose ends. i think it just confirms what i always thought...i am a **process** person. i enjoy the process of knitting, crochet, spining, dyeing. it's wonderful that i am being productive and creating and end up with a cool knitted good to keep someone warm...but what do i really get joy out of? the process. 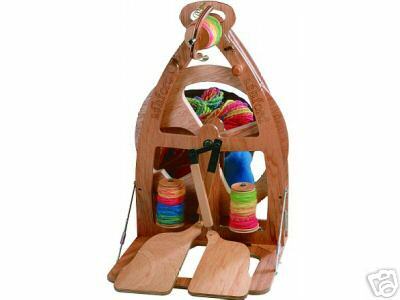 i love knotting together things in different shapes. i love doing it and once that step is done...i'm done. (there also might be something to do here with the fact that i have a hard time finishing/letting go of things, but we will ignore that and just keep talking about the *process*). so now i ponder - does this somehow affect my end product? anyways...in other very exciting news, my loving parents are treating me to a VERY special xmas present. 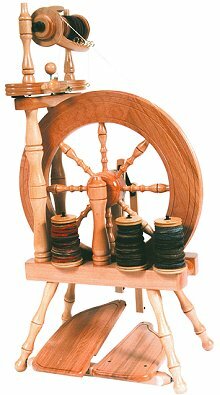 a spinning wheel. i get to make my own yarn. i now have to choose...which wheel to get? i have done some research and asked around. i am looking for something wonderful, easily transportable, can spin any yarn, and wonderful (did i mention that?). i want a piece that i will have my entire life. something that my grandchildren will remember me sitting by and making them yarn out of a big ball of hairy stuff, which gets put on needles, which makes them warm sweaters. any thoughts? advice? tips out there?? ?